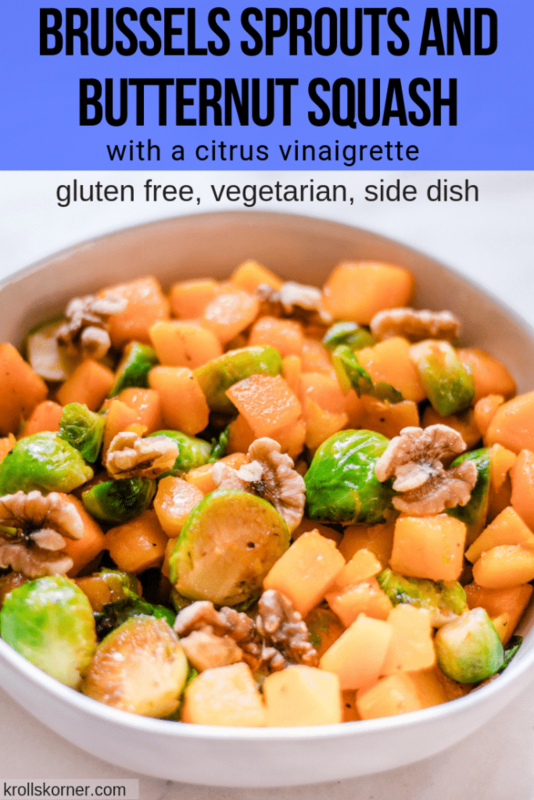 This Brussels Sprouts and Butternut Squash side dish is an easy and delicious side dish full of citrus flavor! Brussels sprouts are a vegetable people either love or hate… or have never tried them before and assume they hate them! I used to be part of the Brussels Sprouts are gross club, but I never given them a chance! Now I eat them at least once a week! It’s all about how you prep them! I recommend giving Brussels sprouts a chance by trying out the recipe below. Packed with vitamin C and K this side dish will be one you and your family/friends new favorites. Roasting the veggies or on the stove? You have 2 options! You can roast the veggies on a sheet pan in the oven, or you can cook on the stove in a large frying pan with olive oil, salt and pepper! Sometimes during the holidays, the oven is taken or the space on the stove is limited, so you have options on how to cook the veggies! Buy pre-cut butternut squash! One question I get most often during this time of year is “how do I cut a butternut squash?” It’s really easy actually, just takes a little time – and a really sharp knife! Can I make this dish the day ahead? I recommend making it the day of so the veggies don’t get soggy. The great thing about this side dish is that it’s easy and you can PREP it the day before. Cut up the veggies and place in containers. Whisk up the dressing and have that ready to go. So the day of, all you have to do it cook the veggies, and mix everything together! You can also add in dried cranberries or pomegranate arils to make this dish a little more festive! Also – if you don’t have walnuts you can use slivered almonds! Be sure to let your guests know there are nuts in this dish in case of any nut allergies! What other recipes can I make with Butternut Squash? You can try out my Vegan Butternut Squash Soup – it only takes 1 pot to make! Makes for a great appetizer. This butternut squash mac and cheese is creamy and SO delicious! A fun side dish! Butternut Squash Bites are a family favorite – they are cheesy and a 30 minute appetizer that everyone will love! Brussels Sprouts and Butternut Squash cooked with a citrus vinaigrette make for the perfect side dish during the holiday season! Peel the butternut squash and cut in half. Scoop out the seeds and then cut in small cubes. (Or buy the pre-cut squash to save time!) In a large frying pan over medium heat, heat 3 T EVOO and place the butternut squash cubes in. Season with salt and pepper. Cook the squash until tender, about 20-30 minutes. Be sure to stir frequently. In a large frying pan over medium heat, heat 3 tbsp. olive oil and place the butternut squash cubes in. Season with salt and pepper. Cook the squash until tender, about 20-30 minutes. Be sure to stir frequently. While the squash is cooking prepare the Brussels sprouts. Wash them, cut off the stems and peel loose leaves off. Cut them in half, and larger sprouts you can cut in fourths. When the squash is done, remove from pan and set aside in a bowl. Pour remaining olive oil in the same pan and cook the Brussel sprouts. Flip them so they get a nice roasted look. These take less time, about 10-15 minutes. While the Brussels are cooking, prepare the citrus dressing. Mix all of the ingredients in a small bowl and whisk together. 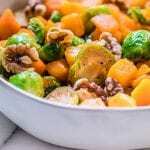 Combine the Brussel sprouts and squash together and toss in walnuts and dressing. Garnish with thyme and enjoy! Recipe inspired by Amanda, blogger behind Heartbeet Kitchen. What is your favorite side dish during the holiday season?! Let me know in the comments below! Pin this Brussels Sprouts and Butternut Squash side dish for later! This will be a new favorite for you!! Such a great combo! These are beautiful- love the pops of color! The citrus vinaigrette really took this recipe up a notch! This was a great recipe for Thanksgiving! I wanted something different from maple so this paired well with everything on the table this holiday! I’m so glad it was a hit! Thank you Meme! This looks so easy- I love the additional of the walnuts! Thank you Liz! And if you don’t have walnuts on hand, you can use pecans or slivered almonds! Loovveeddd the citrus vinaigrette, so amazing here! Such a great compliment to these particular veggies. Thank you so much for making – I hope you and your family had a wonderful Thanksgiving! I made this with 75% ingredients from my own garden – I’m so proud!! So delicious and easy! Omg, that is amazing!! I bet is tastes extra delicious coming from your own backyard! Thank you! I used to hate Brussels as well, not anymore! And now I have another amazing recipe to get them in!